Price: £8.99 (incl VAT) Sorry, this item is currently unavailable. Click here to receive notification when this product comes back into stock. Safe and Sound Double Mattress Cover is a fully fitted waterproof and elasticated sheet that securely fits over a standard double mattress. Double mattress cover 190 x 135cm. 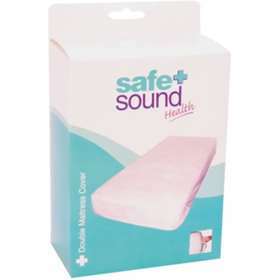 Safe and Sound Double Mattress Cover helps avert liquid reaching a mattress underneath due to its waterproof design. Fit over standard double mattress and securely and completely cover with bed sheet. Use on a mattress of sufficient size to ensure a secure fit. Not suitable for use in a cot. Keep away from children at all times. Never sleep directly on this mattress cover. Keep away from sharp objects such as mattress handles in case of piercing. Product code: SA8363 Price: £8.99 (incl VAT) Sorry, this item is currently unavailable. Click here to receive notification when this product comes back into stock.